Every time we spin those reels we're thinking "this could be it!" aren't we? It's not hard to understand what a shock it must be, though, when you actually DO hit the jackpot! A recent progressive jackpot winner at WinADay Casino -- the casino's second biggest jackpot ever -- certainly knows that feeling. Sascha K from Germany is still trying to get his head around his $226,053 win. 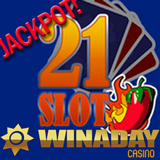 Most of WinADay’s instant play casino games are tied to one progressive jackpot. Sascha won his jackpot playing the popular Slot 21 game. Slot 21 is a 21 payline slot game that combines classic slot machine fun with a variation of a Blackjack card game. Players can double their winnings in the bonus game and play against the bank for the best hand. Sascha spun five Crown symbols, with a bet over $5, to win the progressive jackpot. WinADay’s biggest jackpot ever ($266,800) was won by an American dad playing the Carnival slot game. WinADay has special versions of its 15 penny slots for iPhone, iPad and Android phone and tablet users but Slot 21 isn't one of them... yet.